The state Auditor’s office has established a page on its website which tracks daily financial activity of Missouri’s $9.4 billion general revenue fund. Lawmakers and Governor Greitens allocate money in the fund to pay for operations of state agencies and departments. 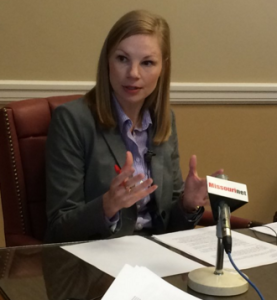 Auditor Nicole Galloway says the page lets the public keep tabs of state finances, online or on a cell phone, just like they do with their personal bank accounts. “Just as you would able to check your online bank account personally, we thought that you should be able to do the same thing with your money that’s public dollars, which are tax payer dollars” said Galloway. Currently, only total daily transactions are posted on the page. But there are plans to expand the amount of information offered to include detailed information about where money is being collected from, and what it’s being spent on. Galloway says it’ll bring the daily financial activity of the state out into the open. The balance of the general fund can change drastically if elements such as tax collections are delayed, or are less or more than projected. Lawmakers who head budget committees in the legislature have access to detailed information about the transactions. The totals posted on the auditor’s web page as of Thursday, March 16th include credits of roughly $51 million, withdrawals of almost $5.7 million and an ending balance of nearly $405 million. After taking office in January, Governor Greitens made roughly $146 million in withholds to shore up a budget crater in fiscal year 2017. His budget for the next fiscal year starting July 1st call for $572 million in cuts to balance an additional shortfall. Galloway, who is a Democrat, recently announced an investigation to find the root cause of the deficit. Look at the auditor’s web page showing daily totals of the state’s financial activity here.